Adults normally only reach up to 3mm in length, but may reach 10mm. They are wingless and easily identified by their tendency to jump short distances when provoked. This jumping occurs when the tail, kept underneath the body and held in place by a clasping appendage, is released. 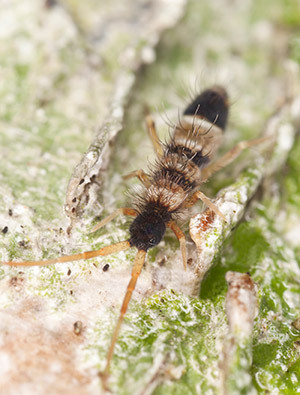 The springtail breathes through the cuticles on its skin and also collects moisture through this process. It inhabits only moist areas because of this biological tendency to not only collect but also lose water through the cuticles. Most species of springtail begin in the soil and reproduce rapidly (known to be 50,000 per cubic foot at times). When they either get overcrowded or when the soil loses its moisture they have been known to invade structures in search of a more suitable environment. They are also introduced inside when a potted plant which they have infested is carried into the structure. Bathrooms, kitchens and other high moisture areas, even insulation moist from a leak, are prime target areas. If the area cannot be dried out properly, a professional may be called upon to apply a residual product in active areas throughout the interior and exterior of the structure of the home. Regular maintenance may be the best solution if your home has a history with these insects. Measures to reduce the moisture content of the areas should be taken, such as through the use of dehumidifiers and fixing any leaks. Vacuum cleaners also come in handy when the need for quickly reducing adult populations in large numbers is required.